JAKARTA (25 August 2018) – Indonesia’s Anthony Sinisuka Ginting got his revenge tonight when he sent world champion Kento Momota of Japan crashing out of the Asian Games men’s single competition in front of a packed Istora Senayan here. 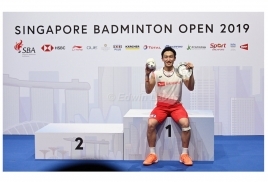 Anthony, beaten by Momota in the team event, got his revenge and downed the world No.4 in straight games 21-18, 21-18. Anthony, ranked 12th in the world, was fired up by the massive support but it was also obvious from his performance that he was determined to upstage Momota. At the Indonesian Open earlier this year, Momota had also beaten Anthony, another reason for the local ace to win today. For his awesome efforts, Anthony will now face China’s former world champion Chen Long in the quarterfinals tomorrow. Momota was the highest ranked player to fall today. Yesterday, topseed Shi Yuqi had fallen to Jonatan, who also advanced today after squeezing past Thai Khosit Phetpradab 17-21, 21-18, 21-18. Apart from Momota, the other main seeds made it through today. Korea’s Son Wan Ho, Chinese Taipei’s Chou Tien Chen and Chen Long advanced to the next stage. 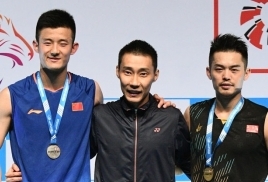 Earlier, Japan’s Takeshi Kamura-Keigo Sonodo and China’s Liu Chen-Zhang Nan, seeded third and fourth, also had their medal hopes dashed when they were bundled out today. Kamura-Keigo fell to the 25th ranked Ong Yew Sin-Teo Ee Yi of Malaysia, while Liu-Zhang were knocked out by Lee Jhe Huei-Lee Yang, the unseeded pair from Chinese Taipei. The Japanese duo’s game today was littered with mistakes and it was no surprise that the lower-ranked Malaysians moved on to the quarterfinals. It was a disappointing end for Takeshi-Keigo who were runners-up in the recent world championship. World No.1 doubles partners, Marcus Gideon-Kevin Sanjaya Sukamuljo, almost slipped up but managed to force their way past Takuto Inoue-Yuki Kaneko of Japan 21-16, 19-21, 21-18. The rubber was tense and the atmosphere electrifying with the screams of the fans. The Indonesians were trailing 11-14 but caught up and was level. Japan went ahead again, but Marcus-Kevin again caught them, but this time managed to edge ahead at 17-16. They never looked back and won 21-18 to the absolute delight of the fans. Earlier in the evening, second seeds, Li Junhui-Liu Yuchen (Chn) scrapped through against India’s Attri Manu-Reddy B. Sumeeth. They won the first game 21-13, dropped the second at 17-21 but managed the squeeze through the decider 25-23. In the women’s singles, Chinese Taipei singles star Tai Tzu Ying remained well on course for the gold with a convincing win over Hong Kong’s Cheung Ngan Yi 21-9, 21-14 in the second round today. Indonesia’s Gregoria Mariska Tunjung, who surprised world No. 2 Akane Yamaguchi in the team event, was unable to pull off another upset today, this time against the third-seeded P.V. Sindhu. Sindhu raced to 21-12 before settling for a 21-15 win to seal her place in the quarterfinals. Akane, meanwhile, breezed past Nangsal Tamang of Nepal 21-7, 21-12 to head into the quarterfinals where she will meet China’s Che Yufei, who won her tie 22-20, 21-17 against Hong Kong’s Yip Pui Yin this evening. The women’s doubles could turn out to be an all-Japan final after their top two ranked pairs, Yuki Fukushima-Sayaka Hirota and Misaki Matsutomo-Ayaka Takahashi, both advanced to the semi-finals tomorrow. Both pairs defeated their Korean pairs today. Yuki-Sayaka, the world No.1, disposed of Lee So Hee-Shin Seung Chan while Misaki-Ayaka had a relatively easy encounter against Kim Hye Bin-Kong Hee Yong. Their rivals will be China’s Chen Qingchen-Jia Yifan and Indonesia’s fourth-ranked Greysia Polii-Apriyani Rahayu. The Indonesians had to work overtime to beat Thailand’s Chayanit Chaladchalam-Phataimas Muenwong 18-21, 24-22, 21-16 in a game that lasted almost 90 minutes today. Meanwhile, the top four seeds in the mixed doubles have qualified for the semi-finals tomorrow. Top ranked Zheng Siwei-Huang Yaqiong from China will meet third-seeded Indonesian pair, Tontowi Ahmad-Liliyana Natsir. A second Chinese pair, Wang Wilyu-Huang Dongping, ranked second, have a showdown with Hong Kong’s Tang Chun Man-Tse Ying Suet.